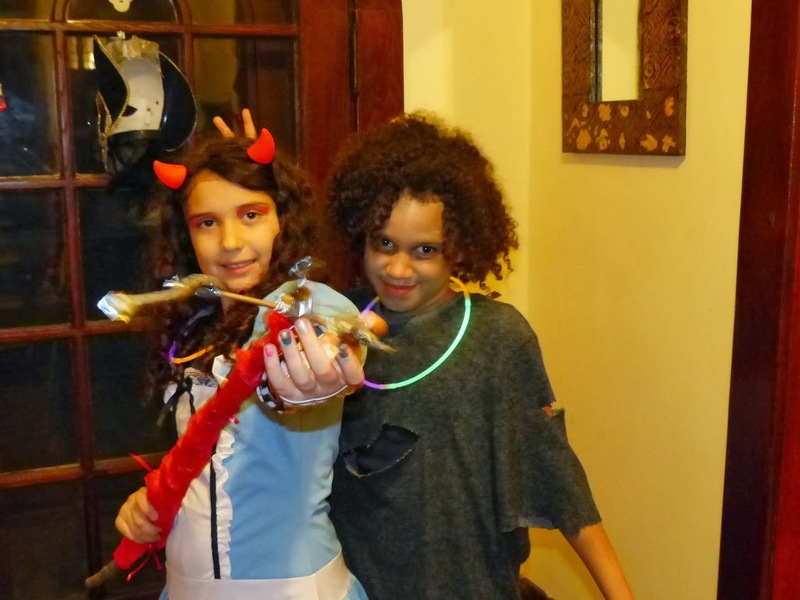 Our first Halloween celebrated on All Hallows’ Eve since 2010. Thank you, snow storms and hurricanes for making a mess of the last two years. But this year, we were determined not to be defeated, despite skies threatening a downpour. Sophie very creatively recycled a couple of costumes and walked around town as the devil disguised as Alice in Wonderland. I love the fact that we didn’t have to buy her a new costume. The pitchfork is our creation and it survived the evening, which is somewhat surprising since we made it out of sticks, duct tape and tissue paper. 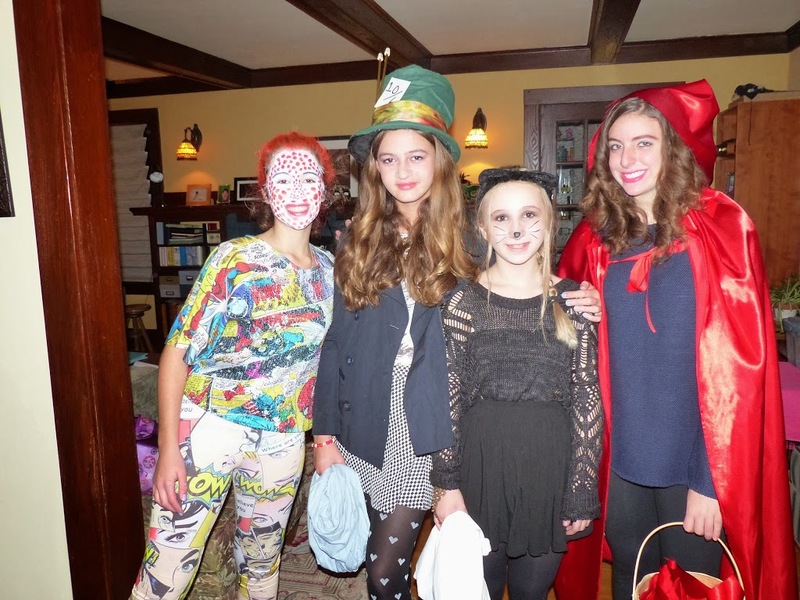 Chloe’s costume, on the other hand, was a bit more of a cipher. She was supposed to be a woman out of a Roy Lichtenstein painting. But many thought she was some sort of comic strip character with a bad case of the measles. After making her friends wait and wait and wait because applying the makeup proved more complicated than she anticipated, Chloe finally gave up. The four girls, armed with a lantern, left the house with a mission to collect as much candy as possible. 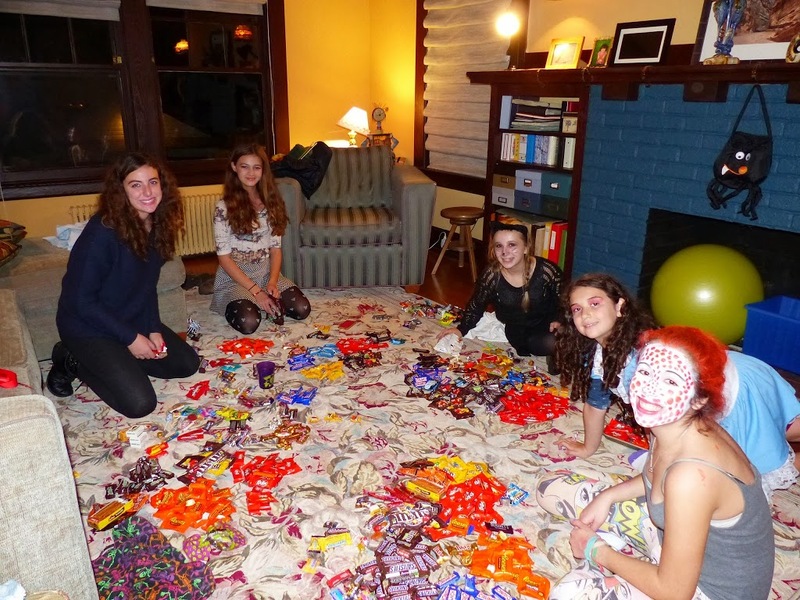 A couple of hours later, everyone came home with pounds and pounds of candy. One woman, ready to call it a night when Chloe and her friends showed up at her door, gave the girls two unopened bags of sweets to share. As they walked away, the woman turned off her lights. By 8:30 this evening, the streets were quiet again and all of the trick-or-treaters had returned to their lairs to inventory their booty. And what a haul it was. Our living room floor – covered in candy. A flood of sweets on our rug. The intense trading session began. And tears ensued – Sophie’s that is. Because she only had one Reese’s peanut butter cup and Chloe had way too many. And Chloe wouldn’t share. It was tragic. All of the excitement was unbearable for Truffle, who was eager to meet and lick everyone who came to the door. He desperately wanted to be part of the fun, but had no idea how to deal with all of the hustle and bustle. He is now passed out in his favorite spot underneath my desk in the kitchen, dreaming of all the chocolate he’s not allowed to eat. Previous PostSchool Projects Turn Me Into a MonsterNext PostI’m Super Truffle. Hear Me Roar.